All translations, annotations and reconstructed diagrams by Octavian Esanu, unless specified. This is a partially annotated and illustrated translation of the Dictionary of Moscow Conceptualism based on Andrei Monastyrsky's Slovar' Terminov Moskovskoi Kontzeptualinoi Shkoly (Moscow, Ad Marginem, 1999). The Dictionary of Moscow Conceptualism, edited by Andrei Monastyrsky – the leader of the "Collective Actions" group (hereafter abbreviated as KD, for the Russian Kollektivnye deistvia) – was first published in Russian in 1999. 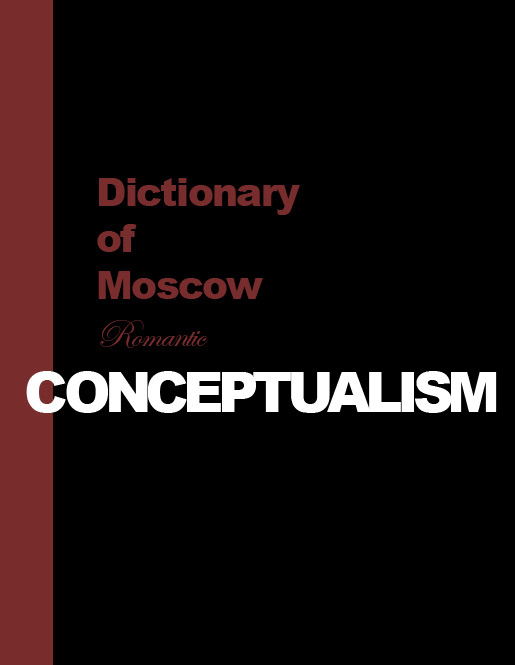 The Dictionary may be regarded as a discursive map of Moscow Conceptualism, a map that charts the key concepts and ideas that emerged and circulated within this tradition in the course of several decades. The mot à mot translation of this publication's title is "Dictionary of Terms of the Moscow Conceptual School," where the term "school" refers to the three generations of conceptualists in which younger artists were mentored by older, as well as to the fact that many of these artists and poets have regarded their artistic and aesthetic practices as an ongoing epistemological project, that is, as an investigation of art's conditions of possibility. In this regard the work of the Moscow conceptualists, and of the "Collective Actions" group in particular, follows the agenda of the conceptual art of the second half of the last century, one of the main tasks of which was to investigate the nature of art. In its content and function the Dictionary may be compared to the lexicographical literature produced by the representatives of other artistic movements, for example the Dictionnaire abrégé du surréalisme composed by André Breton and Paul Éluard in 1938. Both arrange concepts and ideas that circulated within these traditions in alphabetical order, accompanying each entry with what is ostensibly a short explanation supported by a bibliographical reference and/or the name of the person responsible for the emergence of a particular concept or idea. Unlike the surrealist Dictionnaire the conceptualist one contains no images, thus underlining conceptual art's iconoclasm. But despite their status as "dictionaries," both seek to distance themselves from the academic conventions set for this category of literature, using more open and ludic approaches. For instance, the Dictionary of Moscow Conceptualism, like that of Surrealism, often fails to provide a clear and straightforward definition of the concepts and principles at hand; on numerous occasions it omits bibliographical sources that would otherwise indicate where the reader might find a more detailed discussion of a given entry, often pointing instead to undocumented oral usages; or, instead of a definition, the editor provides a note stating that the artist has simply refused to offer an explanation for the term attributed to him. It would perhaps be useful to discuss the Dictionary, or rather the editorial method employed by Monastyrsky, in comparison to a project initiated by a group of ex-surrealists and academics who regarded themselves in opposition to Breton's circle. The Critical Dictionary appeared as a monthly addendum to the art journal Documents, and was far more concerned with undermining idées reçues than with defining or explaining. Here Georges Bataille introduced, in the form of an entry, the notion of "formless" (informe) – an operation rather than a concept, a performative gesture that aims at transcending such established cultural dichotomies as form and content, formalism and iconology, art and science, beautiful and ugly, civilized and primitive, and so forth. Unlike the conventional intellectual procedures that seek to produce knowledge through the imposition of form (to "form" or to "inform"), the informe-as-method would demonstrate that the universe, as well as any discrete object within it, "resembles nothing at all." The category of EMPTINESS, which is central for Moscow Conceptualism, is comparable in many regards to Bataille's "formless." Both of these terms name operations or procedures that open up new non-authoritative positions for writing, philosophizing or art making, regardless of how paradoxical or absurd their results may appear. "Emptiness" appears in Monastyrsky's Dictionary not only as an independent entry but also as a method, or rather as a lack of method (an "empty method," to paraphrase one of KD's key concepts), fully justifying the "incomplete" and "partial" character of lexicographical reference within the Dictionary, often to the point of frustrating academic inquiry. Unlike the Critical Dictionary, in which Bataille provides the entries with theorizations of their method and extensive explanations, the conceptualists' Dictionary – like the Dictionnaire abrégé du surréalisme – more resembles an index, or a search algorithm that helps re-direct the reader to other sources and names. Although it lacks any clear theoretical elaboration of the overall method used by the conceptualists, remaining in this way truly faithful to the key category of "emptiness," the Dictionary is nevertheless an indispensable inventory of the terms, procedures and names that contributed to what is known as Moscow Conceptualism. Despite its differences from the Critical Dictionary, its main function is very close to what Bataille defines as the main job of a dictionary: it would begin "as of the moment when it no longer provided the meaning of words but their tasks." Monastyrsky's Dictionary fulfills this mission, for it presents the reader with those words, concepts and ideas that acquired multiple meanings and tasks in the work of a group of artists, writers and critics. Its major contribution, however, was to establish the discursive field of this tradition, to map that area of contemporary art and aesthetics that the conceptualist trod. The Dictionary may be regarded not only as a map of Moscow Conceptualism but also as a guide to KD's ten-volume publication Journeys Outside the City, helping the lost traveler to navigate through its dense and often impenetrable content. As already mentioned, the original Russian edition of the Dictionary contains no images. Since this English annotated version is both a translation and a critico-historical interpretation of the original publication, I took the liberty of inserting under certain concepts pictures of artworks, maps or graphs made or employed by the conceptualists in order to make these terms more comprehensible and more easily accessible to a reader who may not be familiar with Moscow Conceptualism or with Soviet/Russian art historical and cultural contexts. The original Russian book is divided into several parts: four introductory texts, the main section of the Dictionary, three appendices entitled "Additional Dictionaries," and a bibliography. For the English version I translated only Monastyrsky's introduction and the main section of the Dictionary, leaving additional material and annexes for another occasion. Translating texts by the Moscow conceptualists may be at times an exhausting and frustrating experience. Therefore, I am grateful to Andrei Monastyrsky for providing me with helpful explanations and advice with regard to many of the terms listed in the Dictionary. I am also thankful to Catherine Hansen for going through the painful process of editing and for making the content of this publication more or less comprehensible to the English reader. 1. For a more consecutive discussion of Moscow Conceptualism see Octavian Esanu, “Transition in post-Soviet Art: “Collective Actions” Before and After 1989” (PhD diss., Duke University, 2009). There has also been prepared an expanded version of this text for publication. 2. André Breton and Paul Éluard, Dictionnaire abrégé du surréalisme (Paris: José Corti, 1991). 3. Sergei Anufriev introduced the entry “Clearness and Peace” (Iasnosti i pokoi) into the Dictionary, but he refused to provide a definition. For terms that omit bibliographical sources see for instance the entries for “schizoanalysis” (Schizoanaliz) or “rotten texts” (gnilye teksty). Andrei Monastyrsky, Slovari terminov moskovskoi kontzeptualinoi shkoly, 100. 4. “FORMLESS – A dictionary would begin as of the moment when it no longer provided the meaning of words but their tasks. In this way formless is not only an adjective having such and such a meaning, but a term serving to declassify, requiring in general that every thing should have a form. What it designates does not, in any sense whatever, posses rights, and everywhere gets crushed like a spider or an earthworm. For academics to be satisfied, it would be necessary, in effect, for the universe to take on a form… To affirm on the contrary that the universe resembles nothing at all and is only formless, amount to saying that the universe is something akin to a spider or a gob of spittle.” Georges Bataille, Robert Waldberg, Isabelle Lebel, with Iain White and Alastair Brotchie, Encyclopaedia Acephalica: Comprising the Critical Dictionary & Related Texts, Atlas arkhive (London: Atlas Press, 1995), 51. 5. On Bataille’s notion of informe see also Yve-Alain Bois and Rosalind Krauss, Formless: a User's Guide (New York, Cambridge: Zone Books, 1997). In the origins of this project lies a very simple consideration, namely that conceptual art deals primarily with ideas (and most often with ideas of relations) and not with the world of objects and its long-established paradigms of naming. The world of ideas (especially the ideas of relations and the relations among ideas) is in a certain sense "nonexistent," therefore the methods of "reproducing" it – if one makes use of an analogy with what we habitually say about the world of "existing" objects – are significantly different from the methods used or accepted in the so-called "everyday world." But let us not dwell too long on the general features and the specifics of conceptualism as an artistic direction. It should suffice to say that in the aesthetics of conceptualism (as in the philosophical aesthetics that corresponds to it) there is a constant attempt to "reproduce" those structures of consciousness that in some form or another are nevertheless "present" in the world; moreover, to reproduce these structures as they perceive themselves within this world, in their endless acts of self-conscious reproduction. In Moscow Conceptualism, as it is presented here in this dictionary, what takes place is not only the naming of some "mental worlds" and of their "inhabitants" – for the most part one witnesses a process of continual research and the construction of an aesthetic discourse, with its methods and principles, which I believe is the central motive of conceptualism. Of course, one also encounters in this dictionary such terms as "Rotten Pinocchios" (gnilykh buratin), but from the strangeness of such terms and from their character it is easily understood that they are mere products of ironic fancy. However, such fancies and fantasies are completely natural for conceptualism as a direction in art (but not in philosophy). Here, in contrast to philosophy, we are dealing with the poiesis of notions. If there is such a phenomenon as "philosophical poetics" then it is conceptualism (at least, in the "theoretical" aspect that this dictionary presents) that emphasizes the poetics: as the emphatically nonexistent that from the beginning requires an unwarranted credulity, and only after that, understanding. So – conceptualism as the poesis of philosophy. It is precisely this, in my opinion, that the reader is dealing with here. And it is precisely from this perspective that Moscow Conceptualism is presented in this book. The dictionary is assembled according to the following principle: it contains, first, the general or the main section, where the terms are introduced together with their definitions. All the definitions (except in specified cases) are written by the authors of the "terms" (or "words and phrases," since many readers would hardly agree with the choice of "term" for most of the words presented here). For this section I had to make some restrictions, first of all with regard to myself and to Pavel Pepperstein. It turned out that both of us had too many terms, and if we had brought all our terms into the main section then the presentation of the authors would have been imbalanced. Some authors have just one term. In Pepperstein's and my own case it is very easy to explain this seemingly boundless pleonasm. This is because he and I, we are both members of artists' groups; he is a member of Medgerminevtika (MG) and I of the Collective Actions group (KD). We had – in a certain sense – to "lead," to construct the ideologies and the discourses of these two groups, and maybe it is because both of us are "poetically oriented". I came to conceptualism from poetry, and Pavel is still writing poetry and prose. Every group is connected by one (or by several) ideas. If such shared ideas do not exist, or if they are quickly exhausted, then the group is falling apart. When an artist group begins its aesthetic journey it has two kind of maps (this is what sets it apart from a tourist group): one is of the usual and "objective kind," as it consists of artistic gestures, commercial purposes, and so forth. An aesthetic journey is a journey in between "the sky and the earth," and the second "sky" map must be continually updated during the trip. Initially this map consists entirely of white spaces. In addition, on this map one must preliminarily spot some "interesting places" towards which the group is moving – the map must also simply be, it must exist and contain already some of the most basic and fundamental features: the scale, the division into rectangles, the elements of landscape (tradition), and so forth. Besides tradition, which provides this preliminary pre-mapping, there is also the system-building introduction of new concepts; this also has sufficient inertia to keep the "running mechanism" (the travelers) moving by themselves, mechanically, so that at some point there is the possibility for something interesting to emerge. At this point mechanical inertia turns into inspiration. This is to say that on this map there must be outlined the distinctive contours of the aesthetic system (or even systems), there must be drawn the aesthetic ideology of the group, so that the group can continue to exist. Since the groups KD and MG have been active for quite a long time, it may be said that they have their "celestial" maps with many marks already drawn on them (judging by the number of terms introduced by Pepperstein and myself). But everything has its reasonable limits. I had to make "Appendix 2," in order to add terms by other authors. In the section entitled "Additional Dictionaries" there takes place a certain deciphering of the principal terms from the main list. The terms by S. Anufriev and P. Pepperstein were actually included in the "Additional Dictionaries" in order to extend such notions of MG as "individual psychedelic practices," and so forth. These are the "interesting places" on the aesthetic map of MG. For my part, I included here terms related to the "theory" of demonstration/exposition semiotic fields (these are, so to speak, the technical details or the partitioning into squares of KD's aesthetic map) and to the schizoanalytical texts. It is interesting to notice that the purely technical impetus that initially conditioned me to create the section "Additional Dictionaries" out of "sheer necessity" turned out to be a very fruitful idea, as this part became an independent genre within the main dictionary. Y. Leiderman, who initially contributed with a concise list of terms for the main section of the dictionary, later composed his own "Additional Dictionary," which is very interesting in my view, because it possesses all the features of a poetic-philosophical work – compositional integrity of words and their definitions, interrelationship among the constituent elements. We have been talking about the "journeys" of two groups – KD and MG. However, we should not forget that the basic content of the dictionary constitutes the discourse of the Moscow conceptualist school. The latter also has its big map, in the construction of which all the authors of this dictionary took part. And on this level, that of the big general map, it is not important how many terms each author has contributed. Perhaps the presence (or absence) of one single term, which at first glance may even seem unimportant, has accounted for the very existence of the entire aesthetic map of Moscow conceptualism during almost thirty years. Unfortunately, for various (mostly technical) reasons, this dictionary was elaborated without the participation of Erik Bulatov, Oleg Vasiliev, Vsevolod Nekrasov, Rimma and Valery Gerlovin, Nikita Alexeev – artists and poets without whom it would be very difficult to imagine Moscow Conceptualism.